Known the world over for her great advances in the field of nursing, Florence Nightingale reduced the mortality rate in Crimean hospitals by two-thirds and was superintendent at the Institute for the Care of Sick Gentlewomen in Upper Harley Street, London. 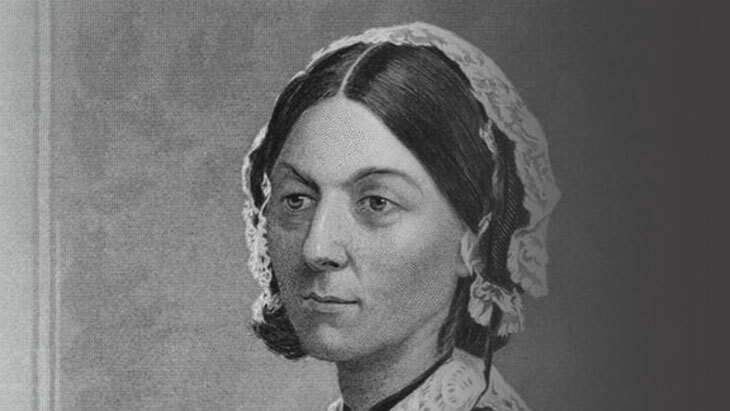 Florence Nightingale, OM, RRC, DStJ is generally regarded as the founder of modern nursing. Her name has become synonymous with patient care, Florence Nightingale was a social reformer and statistician who came to public attention while serving as a manager of nurses, trained by her, during the Crimean War. She organised the tending of wounded soldiers and became known as "The lady with the lamp", famous for her nightly rounds of tending to wounded soldiers. In 1860, she established St Thomas' Hospital in London. The Hospital was the first secular nursing school in the world and now part of King's College London. Born on 12 May 1820, Nightingale was born into an upper class British family in Florence, Italy, and she was named after the city of her birth. The family moved back to England in 1821 and the family homes were situated in Embley, Hampshire and Lea Hurst, Derbyshire. In 1837 Nightingale received the first of several "callings from God" prompting a strong desire from within to devote her life to the service of others. Despite her family's opposition to her working as a nurse, she entered the field in 1844, causing intense anger and distress to her mother and sister. She took a nursing job in a Middlesex hospital for ailing governesses in the early 1850s. Her performance soon led to a promotion to superintendant and her first challenge was grappling with a cholera outbreak. Nightingale significantly lowered the mortaility rate of the hospital by improving its hygiene practices. On 22 August 1853, Nightingale took the post of superintendent at the Institute for the Care of Sick Gentlewomen in Upper Harley Street, London, a position she held until October 1854. When the Crimean War broke out there were no female nurses stationed at hospitals in the Crimea. Nurses at the hospitals had suffered a poor reputation, leading to shortages of nursing staff. She received a letter from Secretary of War Sidney Herbert, asking her to organise a corps of nurses to tend to the sick and fallen soldiers in the Crimea. She created team of nurses from religious orders, and sailed to the Crimea within the week. Upon arrival Nightingale observed that there more soldiers who were dying as a result of hospital infections than of the actual injuries they had suffered. She quickly set about improving sanitation, procuring hundreds of scrub brushes and asked the more able patients to scrub the inside floor, ceilings and walls. She dedicated her life to patient care, earning a reputation for her compassion and carrying a lamp through the dark wards in the evening and night. The patients dubbed her “the lady with the lamp”, others called her “the angel of the Crimea”. The mortality rate of the hospital decreased by two-thirds. Whilst stationed in the Crimea, Nightingale also set about creating an “invalid’s kitchen”, a patient laundry service and a classroom with library. She produced an 830 page book on her experiences at the Crimean War and proposed reforms for other military hospitals. Her book transformed the War Office’s administrative department and led to the establishment of the Royal Commission for the Health of the Army in 1857. On returning to her childhood home at the close of the war, in 1856, she received a hero’s welcome, a reward of a brooch from the Queen, which came to be known as the “Nightingale Jewel” and a sizeable financial gift from the British government. She put her money towards the establishment of St. Thomas’ Hospital and the Nightingale Training School for Nurses. While at Scutari, Nightingale had contracted “Crimean fever” and would never fully recover. By the time she was 38 years old, she was homebound and bedridden, and would be so for the remainder of her life. Nevertheless, Nightingale continued to work from her bed. She continued to remain an authority and advocate of health care reform, interviewing politicians and welcoming distinguished visitors from her bed. In 1908, at the age of 88, she was conferred the merit of honour by King Edward VII. Sport injuries are a common problem among sports enthusiasts. New London Centre raises the bar in joint replacement care.